Adams Construction Services provides a complete range of home improvement services available from initial concept and feasibility through all phases of design, contractual arrangements and construction completion. ACS provides one source for all your construction needs, employing those trades required for proper code compliant installations not performed by our own staff. When you hire ACS for your construction needs, you are hiring an experienced renovator who takes personal responsibility to ensure a professional renovation. Since a house is the largest single purchase most of us will ever make, a basic knowledge of how a house works (and what it means when it doesn't) will help make you a more informed home buyer and/or homeowner. Construction and renovation of homes today has evolved from simple dwellings to complex structures combining latest state of the art construction techniques and materials making the task of building increasingly difficult and posing greater potential for problems. ACS can provide valuable assistance to minimize these problems and meet client needs from initial concept and feasibility through all phases of design, contractual arrangements and construction. Adams Construction Services can also provide expert assistance regarding the Ontario New Home Warranty Program (Tarion) as it relates to your new home purchase whether during construction, at pre-delivery, post-delivery or conciliation of disputes. ACS can take the mystery out of new construction practices & the concerns out of existing construction. Our growth and success has resulted from our commitment to customer satisfaction and quality workmanship. When you contact Adams Construction Services regarding your specific needs, I would be pleased to provide specific customer references pertinent to your project and enable you to discuss my services in complete candor and privacy for all parties. "Roger has assisted us with three separate building projects. In 1988, he provided us with a custom design and permit drawings when we were renovating and adding an addition to our home. Later, when we were considering purchasing another property, he did a site inspection for us. This helped us identify potential structural and masonry problems for which Roger also provided solutions that could be done at a reasonable cost. He also advised us regarding the necessary permits required. In the fall of 1992, we encountered some problems with a general contractor and once again turned to Roger for advice. His expertise enabled us to deal with the problem effectively from a knowledgeable point of view. We are very impressed with everything Roger has done for us and would highly recommend his expertise to anyone." "I found Roger to be highly knowledgeable in areas of building construction and architectural design. I found him to be extremely thorough in his inspection techniques, very capable in the identification of existing and potential construction problems, and adept at providing information regarding required remedial action in identified problem areas. In addition, Roger provided design and construction consultation services to my husband and I when we constructed our home four years ago. We found him to be very knowledgeable in the area of architectural design and well versed in current Building Code requirements. Should you be contemplating the construction of a new home or an addition to an existing home, a renovation project, or the inspection of a new or existing dwelling, I consider Roger highly competent in these areas and would recommend his services for any or all of the above." "Roger worked with my wife and I on our home plans for our house. He has a good working knowledge of home construction and drafting. Roger constructed a cardboard model of the house showing window and door locations, as well as the basic shape of the structure, which we found very helpful. We met with Roger several times to discuss changes, etc. When we built the house, everything worked out well, particularly some tricky roof venting at the front, which Roger designed to vent up through the front wall and works very nicely." "I want to thank you for the time that you spent and the interest that you showed re the construction and drainage project at our residence. I would certainly consider you if I ever decide on any other projects and would recommend you to anyone else." "THANK YOU FOR A JOB WELL DONE: We appreciate the time and caring you put into your drawings which enabled you to take a small cottage and turn it into a beautiful home. We thank you for the many times you came to our home for us to approve any changes you were making. Roger, we would highly recommend you to any prospective clients." "I've had ACS do a couple of projects and am impressed with the attention to detail. This thoroughness has resulted in both a professionally engineered product and an aesthetically pleasing design." "I found the quality and value of ACS's work to be of the highest order. Roger Adams demonstrated professionalism and thoroughness throughout completion of the project, sending digital photos of work in progress, identifying cost saving alternatives and earning the respect and recommendation of this satisfied client." "Excellent quality of workmanship, innovative, knowledgeable, excellent design ideas, very thorough and professional, on-time, on budget. Overall very pleased with all work done by ACS." 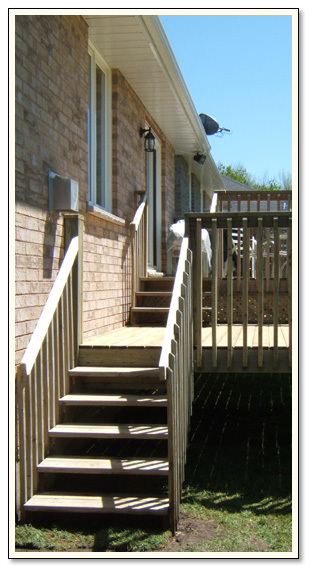 "We have used the services of ACS for 2 projects; a back yard 16 x 24 Cedar Deck and a complete basement renovation. As new residents of Peterborough, we were immediately impressed with Roger's knowledge, his honesty and integrity. He explains what he is going to do in great detail and listens well to suggestions. His quality of workmanship is excellent. We have no problem recommending his services." "I was very pleased with the work you performed. The quality met my expectations, and you personally were very professional and I felt safe having you in my house. We received many favourable comments on the "New Look" and the way the project opened up our house." "We have used the services of Adams Construction Services twice. We were very pleased with their overall competence. When the job was finished everything was cleared up and tidy. They carried out this job with skill and know–how and in the end we were very pleased. We highly recommend their quality of work, thoroughness and courtesy on the job."